When one commits an indiscretion, there's nearly always a way back into the other person's good graces. And nothing works to achieve this end like a cold, freshly poured glass of Great Redeemer old ale. An enticingly woody aroma with hints of aniseed, raisins, prunes and dry hops give it a character that effortlessly atones for any shortcomings in yours. So next time someone has the pip with you, pour them a Great Redeemer and all will be forgiven. Kit Contains: Malt, Yeast (Mangrove Jack's Beer Yeast UK Dark Ale 10g), Hops. NOTE: This variant requires an additional 1 kg of dextrose. 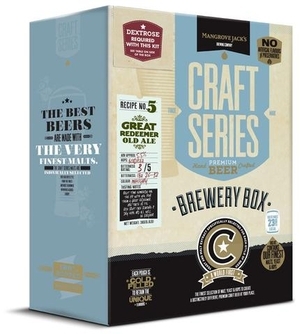 The hops in our Brewery Box range are all gas flushed (either Nitrogen or Co2) which brings the oxygen and moisture levels to below 2% in the sachet, the hop sachets are also packed into foil laminates that provide a 100% barrier and ensures optimum performance for the full shelf life given.